Touch Of Belle : W7 Red Dazzle Nail Varnish! I’ve turned into a bit of a glitter monster lately, I’m loving glitter on my nails! I was sent some cosmetic products from W7 recently and one of them was this nail polish in Red Dazzle which you can pick up for £1.95 from places such as New Look and www.thecosmetichouse.co.uk. 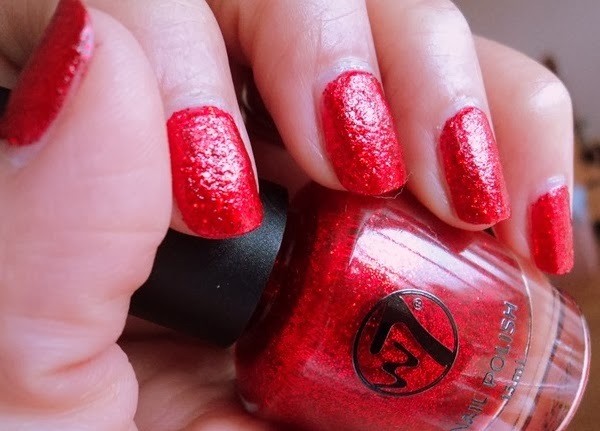 It’s a red polish with loads of tiny red glitter particles, the finished look is really pretty and makes me think of Christmas baubles or Dorothy’s ruby slippers! It’s even more sparkly under artificial light so perfect for statement nails on a night out. The consistency of this polish was quite hard to apply at first as it’s quite thin and so starts to dry really quickly so you have to work fast, but the second coat applies much easier, I found it looks better with a topcoat but if you want a textured feel/look then I would just stick to this nail varnish. I really love this look, I keep catching myself looking at my nails as they’re just so pretty! It’s a strong contender to be my polish of choice on Christmas day as it’s so festive! Maybe this with a green bracelet and a little gold glitter on top? Thank you :) It is perfect for this time of year! This is pretty. I usually only see w7 at the pound stores. Will have to look for this shade. It is such a lovely shade and I love the texture it gives! You can get some good buys at the pound stores! Paradise Apartment big real estate in Lahore. Paradise Apartments have well-furnished rooms with terrace, lounge mostly rooms are air condition and all units have a kitchen. An ideally and tremendous place for you and your family at an affordable price. Paradise giving the services of Security Cameras , Automatic Lifts, Food Court, Completion Guaranteed, Durable Constriction, Flexible Payment Plan, Commercial Area. its nice content and particularization, where improve fashion quality. we posted our link, its related to this. please visit this..